I have a 4 inch griggs style reactor on my 75g. 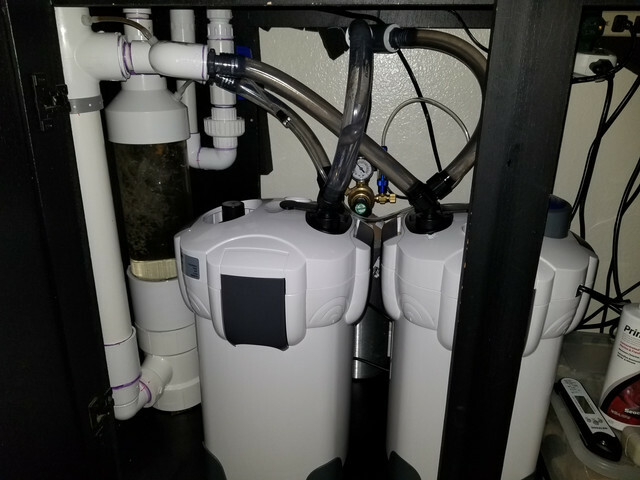 It has two Sunsun filters putting out around 1000gph combined, probably less with the plumbing. For the most part it works great as a co2 reactor. Even turned way up no large bubbles are able to form at the top because of the cone shaped coupler on top. I wanted to build it to be a very low maintenance reactor, without media in it so I wouldn't have to take it apart to clean it all the time. I also didn't want to put any back pressure valves on it which I think just kill the flow. While it does work, I would like to improve its efficiency at chopping and dissolving the co2. I thought about somehow mounting a circulation pump inside near the top so it would chop up the bubbles, or possibly off to the side so it would cause a spinning effect like a tornado. But most submerged style pumps need their magnetic cleaned often which would mean dismembering the reactor. I was thinking about a pump that I could mount outside the reactor, that could have its intake drawing from the top of the reactor where the bubbles are, thus chopping them up, then pushing them back into the reactor. That way I could clean the motor without removing the reactor. Or some kind of motor with a shaft that goes through the side of the reactor with some sort of spinning blade inside. Anyone have any ideas? This reactor is on the intake side of the filters and is plumbed with a one inch pipe before the reactor so co2 diffusers won't work without a redesign. Below is a picture of the reactor. Thanks for any suggestions! This is going to sound mean but this is a place where I see things going way off the good design that Rex Grigg's had and it has now become way too complex, so I would recommend going for simple that works rather than adding more which may only add to the trauma. Dropping back to the Grigg's design, without mods, will cost far less in time, effort, and materials and work far better. There really is a good reason the Grigg's works well enough to almost become a "standard" for reactors. Built to the original design, it is simple and works. This is the design that I follow for everything for 55, 75, and 120 gallons and it works very well when used on the output of a single filter, rather than on the input to two filters. Sometimes when we try to improve the mousetrap we only get a more complicated mouse trap but it doesn't work very well. No offense taken! Thanks for the suggestion. I agree the Griggs reactor is great and that is why I built it, I was just thinking of ways to make mine a little more efficient by breaking up the bubbles better. To get the co2 levels I wanted I am running a uncountable bubble rate and the reactor is having some trouble keeping up. My co2 shuts of at 9pm and last night 5 hours later at 2am there was still a large amount of co2 bouncing around in the reactor. With the lights on the drop checker stays green, but I noticed it was yellow last night, probably because without the lights there was no o2 coming from the plants. I was searching around and found that Tom Barr actually built the design I was considering, here is the link. I was thinking about doing something similar with but a bit more simple, just a line that took if from the reactor, through the pump and back into the reactor. It would still be pretty simple and it might break things up better. Below is an poorly drawn illustration of what I was thinking.